This is Ola Eudora (Case) Rodgers, my great grandmother. She was born on January 14, 1880 and gave birth to my grandmother, Blanche Winifred (Rodgers) Doty on July 11, 1898. She died of tuberculosis (consumption) a year and a half later on December 6, 1899 at age 19. 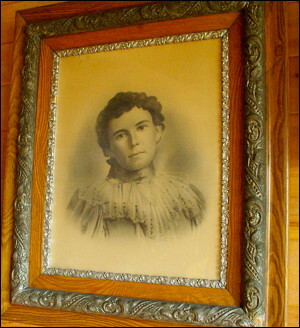 She was buried in Antioch Cemetery in southern Oregon near the family homestead in Beagle. This photo was taken on December 3, 1897 when Ola was 17. Her portrait was put in this frame in 1917 and since then has hung on the walls of various generations of Doty homes, the latest being mine.